This article was first delivered as a lecture at the National Sculpture Factory in Cork, Ireland on the 27th of July, 2011. In July 2007, the Irish economist Morgan Kelly warned of imminent economic collapse in Ireland. The then Taoiseach Bertie Ahern responded: “I don’t know how people who engage in that don’t commit suicide…” In 2008, economic pandemonium struck. Kelly was doing what economists do. He was responding to economic data and reporting his views. So what should visual artists do in times of economic pandemonium? Maybe we can learn from history. Go back to December 1846, to a letter written by N.M. Cummins to The Times in London describing harrowing scenes on South Reen Peninsula in west Cork, Ireland. This is where I now live. Shortly before Cummins’s harrowing letter was published, 340 people lived on this picturesque peninsula. A few months later, nearly all were dead. An Gorta Mór (The Great Hunger) killed them. R.G.Kelly: An ejectment in Ireland, oil on canvas, 1848-51, Burns Library, Irish Room, Dublin; image held here. Public museums and galleries are the keepers and promoters of our cultural heritage and with the rise of the publicly funded and oxymoronic ‘Museum of Contemporary Art’ and other community art spaces, they have moved into not only looking after our heritage, but are now also intimately involved in the production of contemporary art. These institutions form the intersection between artists and state and public. These words are quite astonishing, and deeply concerned me, especially when the Australia Council created a strategy of ‘Branding the Arts’ based on the report. I put forward my concerns to the Prime Minister. This is the poem I made from the several responses I received. and will be conveyed to the Australia Council. An intriguing aspect of the Saatchi and Saatchi report was that it was unable to define exactly what art is, although it could tell us that advertising might well be considered art. Maybe Mr Howard’s comments make sense only if we understand that governments have realised it is impossible to control something that can not be defined and it is more effective to influence artists’ production rather than control it. Coincidentally it was around this time that the Kremlin began to crumble and organisations such as Cork’s National Sculpture Factory came into being. Twenty-five years ago this organisation did not exist. Now it is an institution that adds to the cultural fabric of our city and the state, but from which the state also expects a return. It might be in the form of educational courses or work experience programmes for the long-term unemployed. It could also be simply a refuge, so that nonconformist individuals can be supervised in an environment where the director will report to government if Molotov cocktails are being assembled on the factory floor. The National Sculpture Factory in Cork city, photo: D. O’Donovan; image held here. 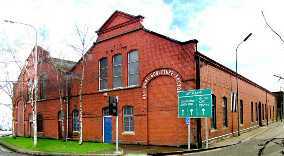 Arts organisations and studios such as this have proliferated worldwide. They are often on a long leash from central government, one or two times removed, with arts councils in between. Depending on personalities, some become fiefdoms of an individual director’s power and influence; in other cases, they become exciting cultural centres of excellence with curatorial policies that encourage diversity of opinion and quality of work. We might not always agree with what these organisations do; however, we want them to exist and prosper, knowing that, if the arts councils stopped funding them today, they would cease to exist tomorrow. None of us wants that. The power structure is obvious. Being on the leash, we know that it can be shortened and tightened very quickly. The race to conform to government expectation can become paramount for an organisation’s survival. It can also mean public criticism can be met with fear and loathing, because a ‘bad report’ sent up to the arts council may mean a cut in funding at the next review. It means that putting critical feedback into arts institutions can become difficult and, if you risk it, you may well find yourself ostracised. It has happened to me. Take a look at this response from an Australia Council employee when I sent them my poetic response to the Saatchi and Saatchi report. A country that claims to be free and does not want to control how its citizens think secretly promotes a way of thinking to discredit another. It’s mind-boggling. I would suggest that the American policy may well be the precursor of today’s cultural policies from Melbourne to Dublin. The CIA experiment showed how you could hold Art much tighter on the leash simply by generously funding and promoting the type of artist whom you wished to see prosper. It’s simple, you encourage people to conform of their own accord, for they will see the success of their colleagues and follow suit. It is surprising to think that our museums are full of what might be considered American propaganda. In reality we were subjected to a massive advertising campaign from an agency with one client and it is feasible that the long leash policy outlived the cold war to spread through the west after the fall of the Berlin Wall. 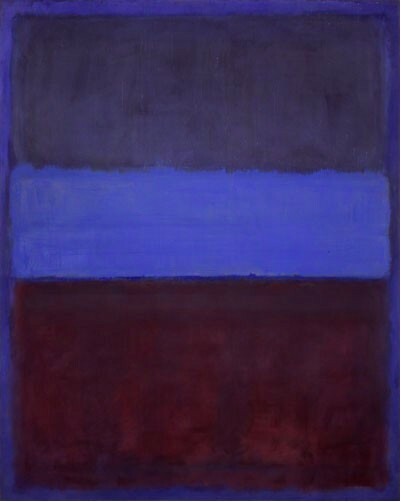 Mark Rothko: No. 61 (Rust and Blue), 1953, 115 cm × 92 cm (45 in × 36 in). Museum of Contemporary Art, Los Angeles; image held here. In London in the mid-1990s I saw Damian Hirst’s name in the papers nearly every week. It seemed that, in every article, there was a reference to a large monetary value associated with his art. I pondered this, for there often seemed no reason to mention what his work was valued at. That Charles Saatchi was behind much of the YBA ‘sensation’ leaves one suspecting that it was actually a broader attempt to re-shape British culture at a fundamental level. In a society that was moving into a ‘surplus culture state’, where consumerism had to be encouraged to keep the economy expanding, then promoting a ‘show us your wad’ mentality in the arts was a way of engraving it into the very fabric of society. Unlike Abstract Expressionism, it was not a covert operation. Remember the ‘Cool Britannia’ campaign that exported British brands globally. At the same time, London art schools were becoming big business, attracting international students who paid small fortunes to participate in a lottery that might see them discovered by Saatchi in the end-of-year exhibition. Maybe she needed to speak like this to forestall criticism of the spend on this event. However her cold economic rationalist comments seem as anti-cultural as John Howard’s comments about content. Dublin Contemporary 2011 at Earlsfort Terrace; image held here. John Kelly is a writer and artist based in west Cork.